I’ve been chatting to Margot about all things wine. Lidl’s chatbot will help you pick out the right wine, whatever you’re planning to cook or spend. So, how does Margot come across? Is she more suave sommelier or scripted cyborg? Here’s what the words she uses reveal. Before you even start to chat, ‘Margot’ brings the right association to mind. She sounds just like the classy next door neighbour you could ask for advice on how to wine and dine that special someone. She’s also got a pretty impressive repertoire of idioms. According to Margot, Shiraz tends to “pack a punch” and chicken Kiev is “screaming out for a flavoursome white”. 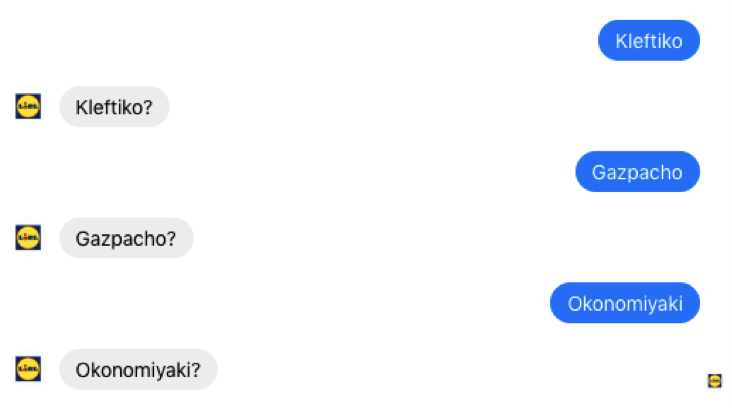 It’s this kind of language that makes for lively conversation. Margot’s a pretty convincing conversationalist, but she keeps things suitably concise, too. Her recommendations rarely spill over three lines – the magic number for engaging customers on a chat. Her sentences are short and crisp, which makes it super easy to understand her in real time. She throws in the odd “Mmmm…”, “Oooooh” and “Hmm” here and there too, which switches up the pace nicely. I ran a few of her chats through our readability test, which gives a Flesch Kincaid reading score out of 100. The higher the score, the easier it is to read. A good rule of thumb for chatbots is between 60 and 70. Margot scored around 78 – that’s an effortless read (even if you’d had a few). You can also ask Margot to help you ‘find a wine’ by country, region, grape, colour or price. This is when you’ll notice a distinct shift in her tone. She starts by asking you to ‘send’ recommendations, which doesn’t sound like a free-flowing conversation at all. She shows she’s actively listening by blurting a list back to us – definitely more robot than real person. 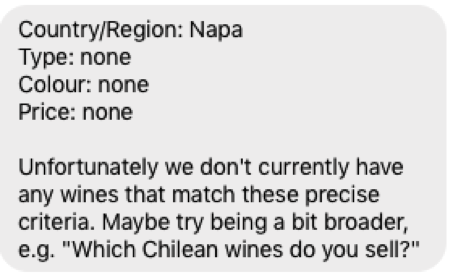 And if you’re on the hunt for a number of different wines, “Here are some suggestions…” becomes pretty repetitive patter. She puts things down to bad luck by opening with ‘Unfortunately’ – which quickly strikes a defensive tone. And describing the criteria as ‘precise’ means she puts the problem back on the customer – she implies you’re being too picky. If you try leading Margot off-script and ask what her favourite wine is, she’ll say: “Sorry I missed that. What did you mean?” Asking an open question here is unlikely to steer the conversation back on track. Bots are better off offering options or asking yes / no questions, to avoid ambiguity. And when something technical goes wrong, there’s no mistaking Margot’s a robot. She goes into meltdown mode: “Error: A server-side error was thrown.” That sounds very out of character for our new fizz-loving friend. Surely she’d just tell us she’s “feeling a bit squiffy”? The variety of natural language Margot recognises is really impressive. And she’s certainly fun and friendly when it comes to food pairing. But depending where else you steer the conversation, you’ll see a few mood swings.